Dredging project at Pompton Lake to remove contaminated sediment from the lake bottom. The sediment has mercury and other contaminants from the former DuPont munitions site nearby. A mucky gray mix of gravel, sediment and peat rolls up conveyor belts and plops onto piles along the shore of Pompton Lake each day, waiting for dump trucks to haul it away to a landfill in Pennsylvania. Since June 5, the largest phase of a long-anticipated three-year project to remove contaminated sediment from a 36-acre portion of Pompton Lake has been in full swing, and local and federal officials say they are pleased with the progress. During a recent visit to the site, Catherine McCabe, the Environmental Protection Agency’s acting regional administrator, said that even if the steep budget cuts proposed for the EPA by President Donald Trump come to pass, the Pompton Lake project will not be halted or delayed, since Chemours, the company responsible for the cleanup, is paying the bulk of the costs. 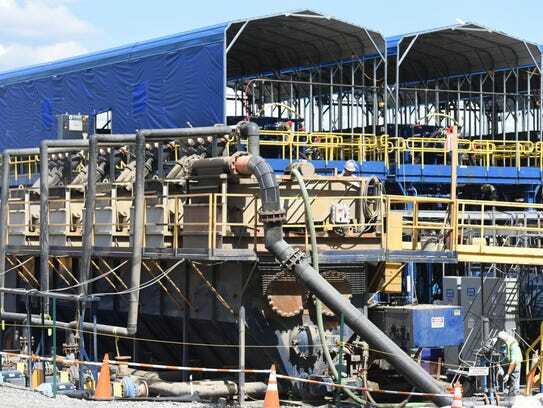 Residents had been bracing for loud noise, smells and clouds of dust from the main staging area along the shore once the dredging project began, but Pompton Lakes Mayor Michael Serra said that hasn’t occurred. To reduce noise and emissions issues, Chemours had high power electric lines temporarily installed to run equipment, rather than using generators. Officials and parents at Lakeside Middle School, which is next to the staging area, thought students might have to stay indoors during recess or that they would have to move school sporting events to a different location.That wasn’t necessary, Serra said. “The residents’ biggest concern had been that after so many years of talking about this project, that shovels would finally go in the ground, and it’s nice to see that happening,” Serra said. The $50 million cleanup will remove sediment laced with mercury, lead and other contaminants that were dumped into the lake by Acid Brook, which carried the contaminants off a former DuPont munitions plant nearby. FUNDING: Who pays for cleanup if Chemours goes bankrupt? Chemours, a spinoff company of DuPont, hired Stevenson Environmental Services as the contractor for the cleanup. 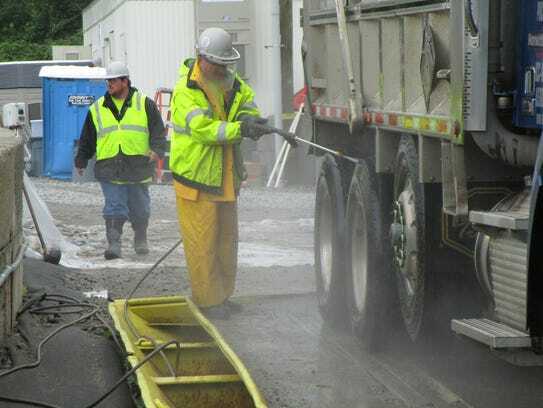 Through the summer, about 128,000 cubic yards of contaminated sediment will be dredged from a 36-acre portion of the lake bottom, near the mouth of Acid Brook, along Lakeside Avenue. During last year’s initial dredging, nearly 29,000 cubic yards of sediment, or about 2,000 truckloads, were removed. Last year’s dredging involved a large scoop on a floating barge working in a small area of the lake. This year’s dredging involves far more equipment, which took several months to assemble on the staging area along the shore. Some of the machinery to process the sediment is several stories tall. The 36-acre work area in the lake is bordered by a floating boom. A turbidity curtain hangs from the boom to prevent disturbed sediment from floating into the rest of the lake. Before dredging began, workers used an electric shock to stun the fish, causing them to float to the surface. The fish were scooped up in buckets and a moved to a portion of the lake outside the turbidity curtain, Epps said. The contaminated sediment gets vacuumed up by a small barge on the lake that uses a GPS system to dredge to a precise depth, which varies in each portion of the lake. The dredging depth is based on thousands of core samples that were taken over many years to determine the extent of the contamination. The sediment then gets pumped through pipes to the staging area on shore. 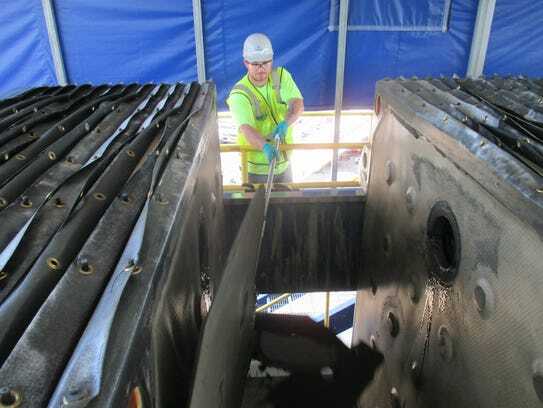 It first enters a series of hoppers – like a giant version of a child’s toy beach sieve – which vibrate and hold larger pieces of gravel but allow the finer sediment to pass through, said Perry Katz, the EPA’s project manager for the site. The heavy, coarse material that is captured travels on a conveyor belt to an area where dump trucks wait to be loaded. The finer material is pumped into six mixing tanks, where a polymer is added to get the material to clump together. At this point the slurry is only 5 percent solids. Then it gets pumped to giant, multi-story presses, which consist of multiple ceramic plates that squeeze water out of the sediment slurry. The presses had previously been used in upstate New York during a cleanup of 2.8 million cubic yards of Hudson River mud laced with cancer-causing PCBs that had been dumped into the river from two General Electric plants about 40 miles north of Albany. The water removed by the presses gets pumped through various filters before being released back into Pompton Lake. The remaining slurry, now 55 percent solids, travels by conveyor belt to the area where the dump trucks are loaded. Each truck gets washed and a cover is placed on top before it leaves the site, Epps said. The water used to clean the trucks is captured and sent through the filtering system before being released into the lake. The mercury, lead and other contaminants bond to the sediment particles, and are not in the water, officials said. About 30 to 40 dump trucks a day leave the site, headed to Pen Argyl, Pennsylvania, and the Grand Central Sanitary Landfill, operated by Waste Management. The trucks were originally slated to travel through an adjacent Pompton Lakes neighborhood. Serra said that he negotiated to have the trucks take a longer route through Wayne to avoid causing more disruption to the residents in the neighborhood. Once the dredging is finished, a six-inch layer of clean fill will be laid on the lake bed to provide new habitat for aquatic life. The fill will come from the nearby Tilcon rock quarry in Pompton Lakes, Katz said. The former DuPont facility, which lies in Pompton Lakes and Wanaque, operated from 1902 to 1994, making blasting caps, metal wires and aluminum and copper ammunition shells the United States used in the two world wars and other military conflicts. The EPA wants the sediment removed because a toxic form of mercury can build up in fish, posing a health risk to humans who eat them. Exposure to mercury can damage nervous systems and harm the brain, heart, kidneys, lungs and immune system. The lake is used by residents for skiing, boating and fishing, but it is so contaminated that fishermen are warned not to eat their catch. As if to emphasize the EPA’s reasoning for removing the contaminated sediment, several people were fishing one recent afternoon in a park along the lake just yards away from the staging area, but said they didn’t know about the potential for contamination in the fish. The 200-acre Pompton Lake is also a backup source to replenish a key reservoir that supplies drinking water to towns in Bergen and Passaic counties. Ultimately about 130,000 cubic yards of material will be removed during the project. Some residents had lobbied the EPA to conduct a more extensive cleanup that included areas where lower levels of mercury were detected in the sediment, but officials decided against that. Next year, in the project’s final phase, the shoreline will be restored with native plants. Previous PostThe 2017 WEDA Environmental Excellence Award for Environmental Dredging was presented to the project team for Onondaga Lake Restoration in Syracuse, New York, USA.